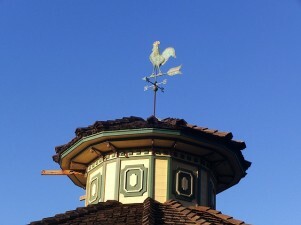 The rooster is a universal solar symbol because its crowing announces the dawn. 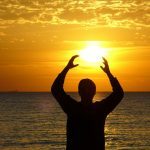 In India, it is the attribute of Skandha, personification of solar energy. In Japan, its crowing, associated with the songs of the gods, lured Amaterasu, Goddess of the Sun, out of the cave where she had been hiding, corresponding to the manifestation of Light. Courage is the virtue that the Japanese and other Far Eastern peoples attribute to the rooster. The Chinese ideogram for rooster is Ki, homophonous to the one meaning “favourable”. Its appearance and its behaviour symbolize the “five virtues”: civil virtues, because its comb makes it look like a mandarin; martial virtues, because of its spurs; virtues associated with courage because of its conduct in battle; virtues in association with kindness, because it protects its hens; virtues related to confidence because of the accuracy with which it heralds the dawn. 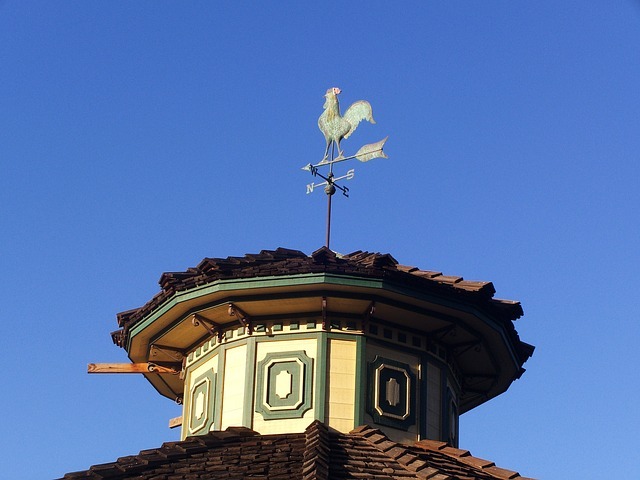 Furthermore, the rooster is also efficient in counteracting the evil influences of the dark night that he drives from the house if the inhabitants paint its effigy on their door. Tibetan Buddhism regards the rooster as an exceptionally ill-fated symbol. It appears in the centre of the Wheel of Life, alongside the hog and the snake, as one of the three poisons. It symbolizes lust, attachment and covetousness that put in motion the Wheel of the Law. In Europe, the rooster is seen as an image of anger, the explosive manifestation of immoderate and frustrated desires. In Greek tradition Velchanos the Cretan rooster-god was assimilated to Zeus. A rooster was standing beside Leto, pregnant by Zeus, when she gave birth to Apollo and Artemis. Thus the rooster is dedicated to solar gods as well as to lunar goddesses. Moreover, the rooster is the specific attribute of Apollo. A rooster was ritually sacrificed to Asclepios, son of Apollo and god of medicine, because the bird heralded the soul of the dead that it was to guide to the Otherworld. Asclepios is also the god who, by his healing powers, brought the dead back to life on earth. This is precisely the reason why the rooster was also the emblem of Attis, the oriental Sun-God, who died and came to life again. This also explains why the rooster is attributed to Hermes, the messenger who travels the three levels of the cosmos. The rooster, along with the hound and the horse, is among the animals offered in sacrifice in the funeral rites of the ancient Germans. In Norse traditions, the rooster is symbol of soldierly vigilance, posted on the topmost branches of the ash Yggdrasil to warn the gods when the giants, their foes, are preparing to attack. When the bird is set on church spires, it assumes the role of protector and guardian of life. It is also an emblem of Christ, like the eagle and the lamb, symbol of Light and resurrection. In the Book of Job, the rooster is the symbol of God-given intelligence while the ibis is the symbol of wisdom. The Talmud makes the rooster a master of courtesy because it heralds his Lord the Sun with its crowing. In Islam, the rooster enjoys a particular veneration. The Prophet himself asserts that the white rooster is his friend because it announces the presence of the Angel. Moreover, the Prophet is said to prohibit cursing the rooster, which calls to prayer. In dream analysis, both snake and rooster are interpreted as symbols of time.